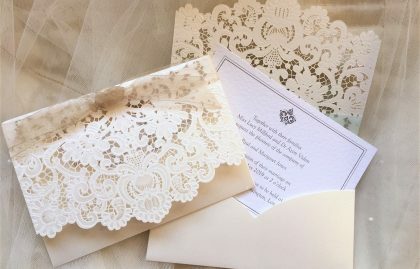 Personalised wedding invitations give your guests’ the first glimpse of your wedding, so we know how important it is that your wedding invites represent your style, wedding theme and tone of the day. 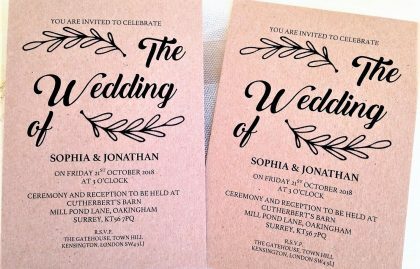 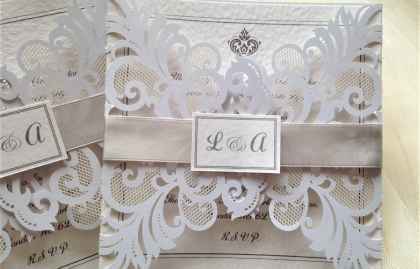 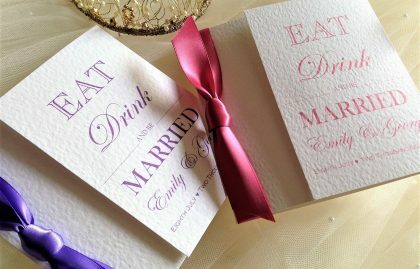 Order you personalised wedding invitations today for quick delivery. 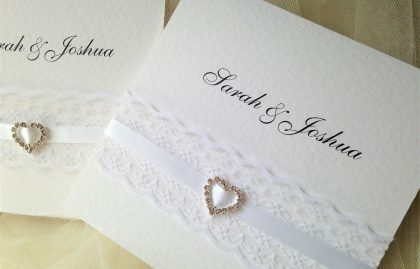 Daisy Chain Invites have made it easy for you to select your perfect invitation. 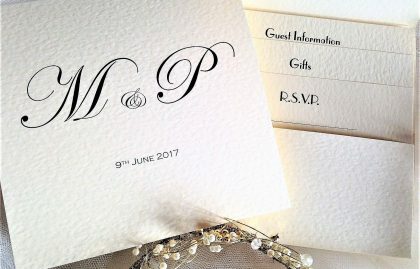 You can shop by card style, by colour or by price. 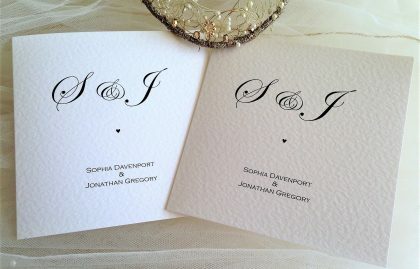 Our affordable prices also include free envelopes and free guest name printing. 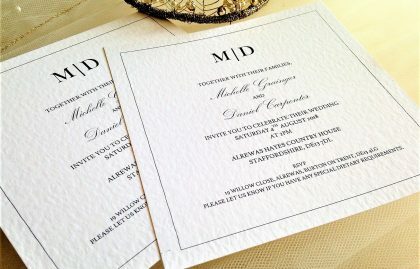 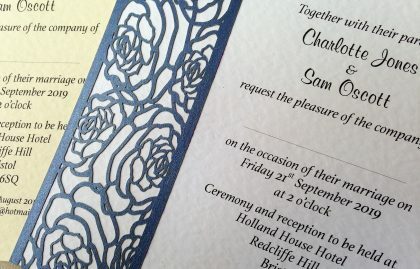 Invitations are designed and printed in house so you can personalise them both on the front and inside. 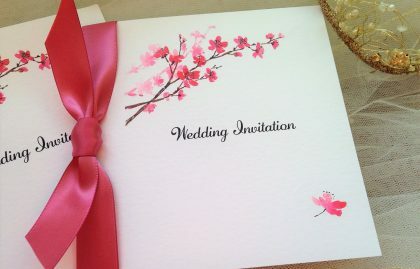 We will do our best to accommodate individual requirements. 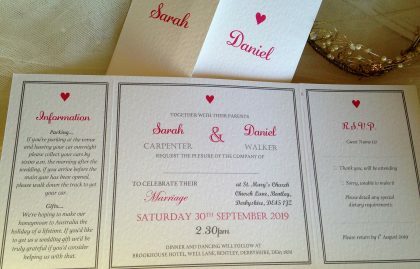 Personalisation can also be included on the front of most of our designs, include the bride and grooms names and date of marriage. 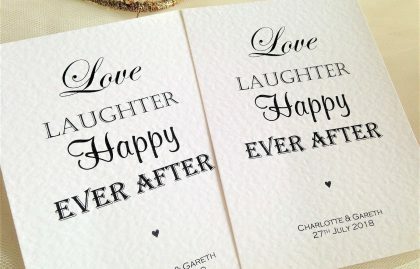 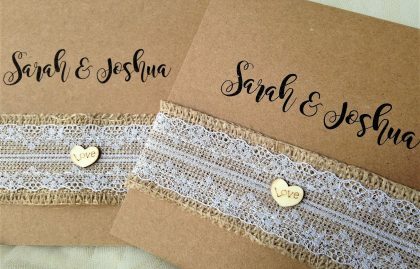 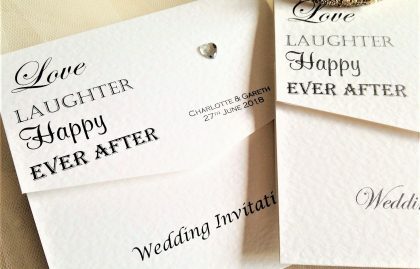 We can print whatever you wish both on the front and inside your wedding invitations. 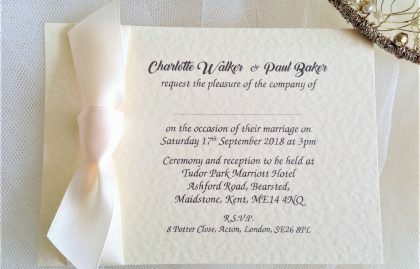 Including any additional information regarding reply details, gifts or accommodation options. 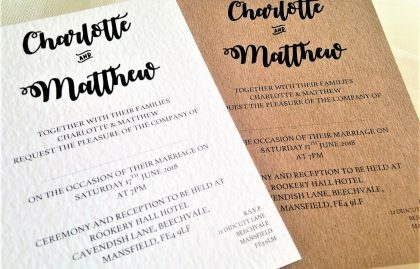 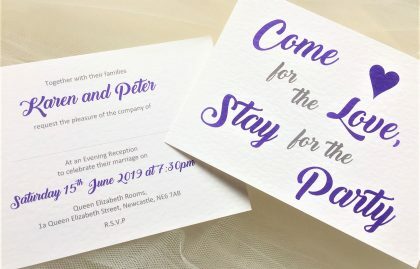 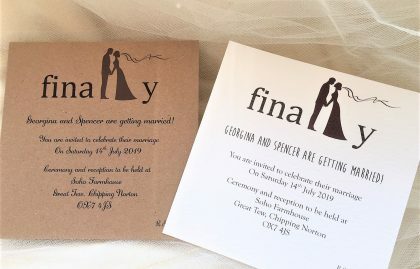 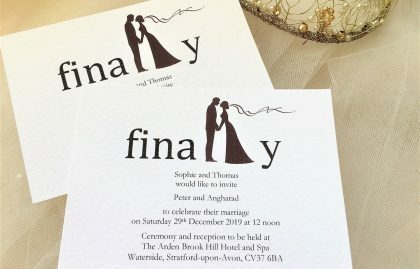 Whether you’re having an intimate wedding with just your nearest and dearest or an expansive celebration with hundreds of guests, we can supply personalised wedding invites handmade for you. 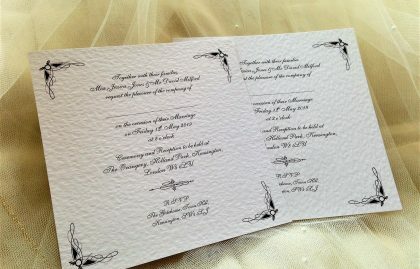 We can supply cheap personalised wedding invitations from just 60p each. 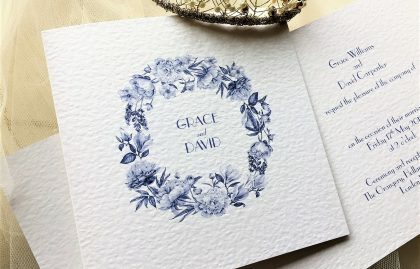 Daisy Chain Invites have been producing beautiful affordable wedding invitations and wedding stationery in the UK for over 12 years. 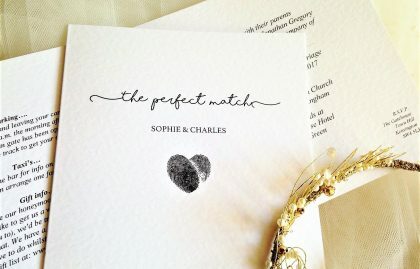 We have built a reputation for offering quality products at affordable prices underpined by exemplorary customer service. 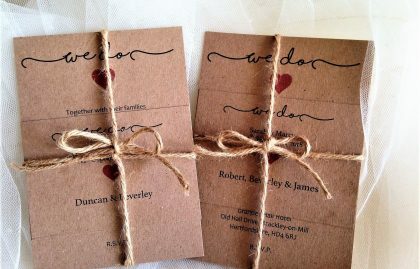 We have an on line ordering system or you can place your order by email. 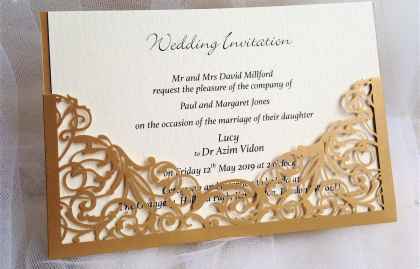 If you wish to speak to someone you can contact us from 9am until 9pm 7 days a week.